Biotinylated Human Dkk-1, Fc Tag, Avi Tag (DK1-H82F5) is expressed from human 293 cells (HEK293). It contains AA Thr 32 - His 266 (Accession # O94907-1). The protein has a calculated MW of 54.0 kDa. The protein migrates as 66-80 kDa under reducing (R) condition (SDS-PAGE) due to glycosylation. 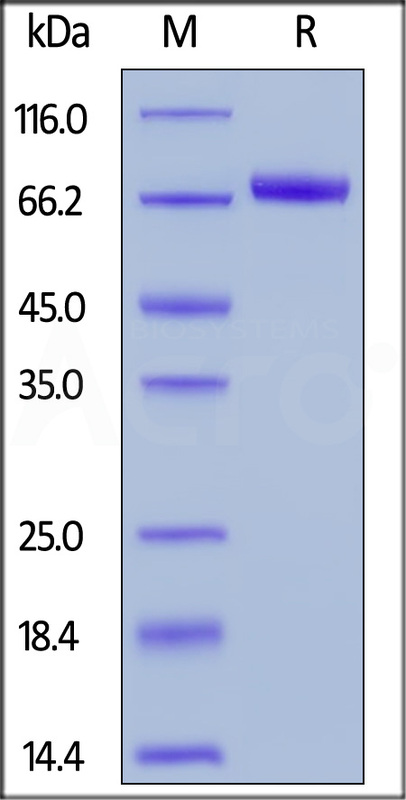 Biotinylated Human Dkk-1, Fc Tag, Avi Tag on SDS-PAGE under reducing (R) condition. The gel was stained overnight with Coomassie Blue. The purity of the protein is greater than 95%. Members of the dickkopf-related protein family (DKK-1, -2, -3, and -4) are secreted proteins with two cysteine-rich domains separated by a linker region. And DKK1 takes part in embryonic development through its inhibition of the WNT signaling pathway, binds to LRP6 with high affinity and prevents the Frizzled-Wnt-LRP6 complex formation in response to Wnts. DKK1 promotes LRP6 internalization and degradation when it forms a ternary complex with the cell surface receptor Kremen.DKK1 not olny functions as a head inducer during development, but also regulates joint remodeling and bone formation, which suggests roles for DKK1 in the pathogenesis of rheumatoid arthritis and multiple myeloma. More recently research reported, DKK1 impacts eye development from a defined developmental time point on, and is critical for lens separation from the surface ectoderm via β-catenin mediated Pdgfrα and E-cadherin expression. (1) Li Y, Lu W, et al., 2010, PLoS One, 5 (6): e11014. (2) Yamaguchi Y, Morita A, et al., 2009, J Investig Dermatol Symp Proc. Aug;14 (1) :73-5. (3) Lieven O, Rüther U., 2011, Dev Biol., 355 (1): 124-37.